When dealing with the combination of feeding problems, food allergies, and picky eaters, it can be tough to get kids to eat anything at all, and you might often wonder how to get kids to eat vegetables. However, research suggests dietary habits are established as early as infancy. The USDA suggests that vegetables should be our main food group, followed by whole grains, then protein and fruit, and finally dairy. Kids often don’t like the textures and colors of vegetables, but that doesn’t necessarily mean they are allergic or have an intolerance toward a food group. Here are some simple Do’s and Don’ts for dealing with picky eaters and establishing healthy relationships toward food and vegetables specifically. Do serve veggies first. If your family doesn’t finish their veggies, think about eating them as a first course so people are hungry and more likely to really finish their veggies. After veggies, move onto grains, protein, and dairy. Enjoy fruit as a dessert! Do make snacks count. Snack time is another opportunity to get the veggies in! Try packing lunches with vegetable snacks and cutting vegetables into fun shapes with cookie cutters to make them more exciting. Cucumbers can be punched into dinosaurs, and bell peppers become stars. There are so many options for healthy snacks for kids, fruit is another great way to make snack time vitamin and nutrient packed. Do make breakfast green. There’s a popular myth that breakfasts need to be composed of breakfast foods. Fruits and veggies make a great easy, healthy breakfast. Think about serving vegetables for breakfast like warm avocado mashed and spread on toast, or sliced tomatoes and mozzarella cheese. Do be adventurous. Resistance often centers on kids thinking food is strange because it’s new. Encourage picky eaters to think of eating new foods as an exciting adventure, and let your kids play with their food if it means exploring the skin and inside of fruits and vegetables. Encourage curiosity! Don’t let them forget where it comes from. Often when kids learn about where food comes from and the farm to table process of growing and cooking that comes before eating, they’re more interested and excited to eat. Visiting farms and farmer markets to buy local produce and letting kids take part in cooking and preparing meals will make fussy eaters more likely to eat veggies and typically unpopular items. Don’t eat on the go. When eating with kids, sit down together in comfortable furniture. Observe the way your children eat. Sometimes kids have difficulty eating because of larger coordination and balance issues. Don’t be fooled by fake veggies. Chips and crackers are often dyed and artificially flavored and labeled as veggie snacks but don’t actually contain the nutrients or health benefits of vegetables, and they often give kids incorrect information about the colors, flavors, and textures of vegetables. Don’t forget to ask. Find out why your child doesn’t like a certain food. Is it the appearance, texture, or taste? Sometimes if something is cut up or mixed or pureed they’ll eat it without a fight. Having conversations about food is a great idea because sometimes when kids know how much effort you put into a meal and how important each item is for their body they are more likely to eat even what they don’t like. 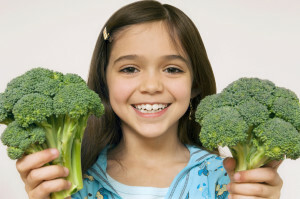 It’s never too early or too late to improve dietary habits and promote healthy eating for kids. Talk to your doctor about persistent pickiness, food aversions, and avoidance if it causes problems or can’t be worked though. Even the cookie monster (or is it the veggie monster?) is on board with healthy eating! Learn about the differences between picky eaters and problem feeders and when you should seek out an expert to help your child. Use our tips to help your children become more appreciative and thankful for the things they have.